open up so many doors for [our daughter] Eva in the future, something she will be able to use for the rest of her life." The innovative Half-QWERTY Keyboard from Matias is a standard desktop keyboard that allows those with limited or no use of one hand to continue typing with the other hand in an easy and natural manner. Carpal Tunnel Syndrome and other typing-related injuries don't always occur in both hands. In cases where only one hand is affected, you can type with the other hand, while the injured one heals. Half-QWERTY's innovative "skill transfer" design makes the transition fast and easy. Periodic rest breaks should be taken, so as not to risk injuring the uninjured hand. Used in conjunction with a Braille display, Half-QWERTY allows blind and visually impaired persons to read what they type as they are typing it, much as a seeing person would. How fast can I learn it? If you've never learned to type before, learning Half-QWERTY will take roughly the time it would take to learn standard two-handed touch-typing. However, if you are a trained touch-typist, you can learn Half-QWERTY in a matter of minutes, with little or no retraining. Published empirical research has shown that (on average) a touch-typist can learn Half-QWERTY in 1/3 the time it takes to learn a one-handed chord keyboard. Half-QWERTY's innovative "skill transfer" design makes this possible. How fast can I type? With practice, Half-QWERTY typists can expect to reach speeds of between 61% and 91% of those achievable by two-handed typists. Typing speeds as high as 64 words per minute (wpm) have been recorded. You place your hand where it would normally be if you were touch-typing - that takes care of that half of the keyboard. To type the letters of the other half, you hold down the space bar with your thumb and do the same finger movement that you would normally do with the other hand. It's that easy! Tapping the space bar still types a space. The relative finger movements used for one-handed typing are the same as those used for two-handed typing. So, if you're already a touch-typist, you already know them. You should be typing one-handed in a matter of minutes. 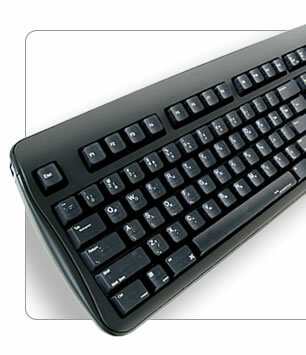 The Half-QWERTY Keyboard allows one-handed typing using either hand, or both, just like a standard keyboard. 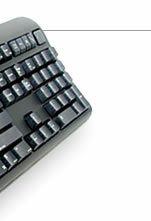 The one-handed typing capability can be switched on or off by the user, as desired, using the "matias" key. Sticky Keys is a feature that makes typing modifier-key sequences (e.g., capital letters) easier for one-handed typists, in that you no longer have to type the modifier (e.g. : Shift, Control, Alt) and the key being modified simultaneously. You can type them in succession. Depressing and releasing a modifier key once makes it active for the next key typed. Pressing it twice locks it until it is unlocked by pressing the modifier again. Can other people still use my keyboard? Yes. The keyboard can still be used for two-handed typing. Half-QWERTY won't interfere. Matias has proudly served the needs of the disability community for over 10 years. Its technology is the de facto standard for one-handed typing in the industry. There are several possible ways to subsidize the purchase of your Half-QWERTY keyboard. With its unique Hydra Cable, the Half-QWERTY Keyboard works with both PCs and Macs . The Hydra Cable has 2 connectors: PS/2 and USB, so there are no adapters to lose. For quickly attaching USB peripherals, nothing beats the convenience of an in-keyboard USB hub. No more reaching through the tangle of wires behind your computer to plug in your mouse, digital camera, MP3 player, keychain hard drive, or other digital device. The surface of each key is clearly labelled with all of the characters and functions of both regular and one-handed typing modes, for easy reference. Non-US keyboards are a little different. They have an extra key in the lower left corner (right next to the Shift key). While the Half-QWERTY Keyboard doesn't have this extra key (it's a US layout), it will let you do this key by typing double-Shift-Z. The keyboard can also remap to whatever layout is standard in your country, by simply choosing the desired layout from the appropriate control panel on your computer. The Half-QWERTY Keyboard comes with a 5 year warranty. Section 508 of the U.S. Rehabilitation Act requires that Federal agencies' electronic and information technology is accessible to people with disabilities. The Half-QWERTY Keyboard is Section 508 compliant. A Voluntary Product Accessibility Statement is available for download. Matias is the proud supplier of the Half-QWERTY Keyboard to the U.S. Department of Treasury through the DESAC III contract, primed by Integration Technologies Group, Inc.